Began a .375/303 conversion on a Lee Enfield that needed it done. 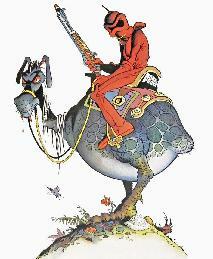 I've contacted Steve Redgwell and one of my best and trusted friends for help on this conversion. More help the merrier though. So reamers, dies and handloading information is what I am after. I did a search here for 375/303 and 375-303 and nothing came up-that surprised me. Soldier, warrior, faith, family and friends. 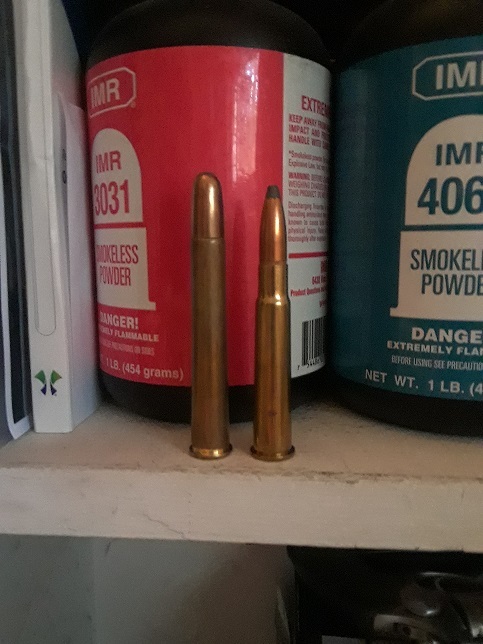 That one is an easy one, as it takes the blown out .303 case. Who's doing the rebore and rifling for you? I've read of one Lee Speed chambered in .375 2 1/2 Flanged NE. I've studied the problem and I can see no way that was done. At least not coming up with anything other than a single shot. 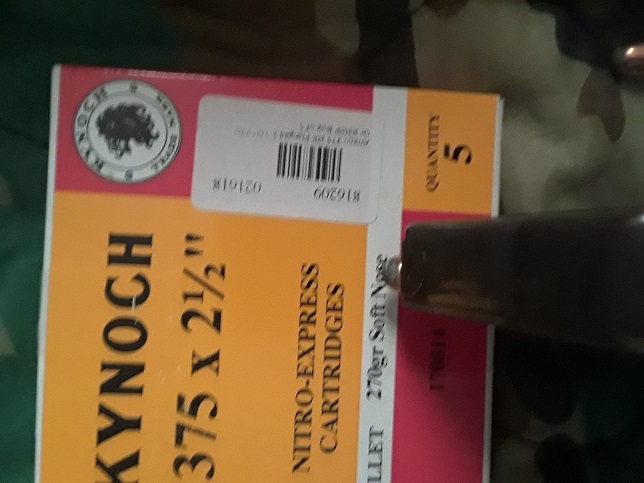 My Kynoch .375 2 1/2 brass is, well, 2 and 1/2 inches long and 3.204 inches over all in length with a 270 grain soft nose bullet. I do believe that a 303 case opened up to .375 is a .375/303 and not the .375 Flanged (NE 2 1/2). JES has rebored and rifled my barrel. I will be doing the chamber work. I was Sure the blown out .303 was called the .375 Flanged. must have slipped a cog I reckon! You have to be careful when talking about 375's. 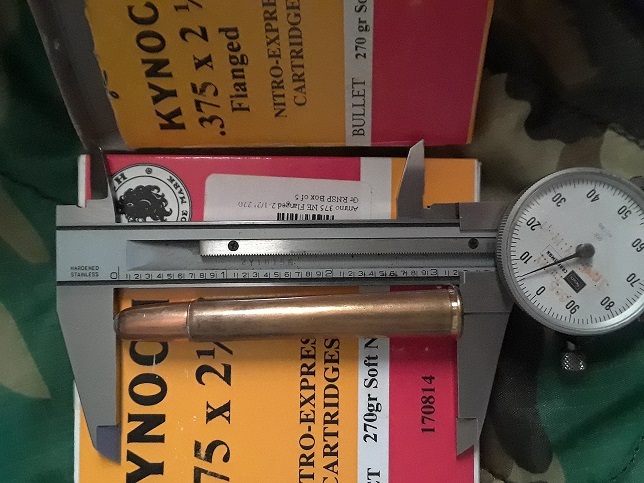 Everybody knows the 375 H&H magnum.....the 375 Flanged generally refers to the rimmed, non belted version of the H&H....the 375 x 2 1/2" flanged NE is basically an elongated 303 but in 375 calibre....the 375/303 is a wildcat cartridge based on the 303 British case straightened to 375 cal.......are you with me so far ?? 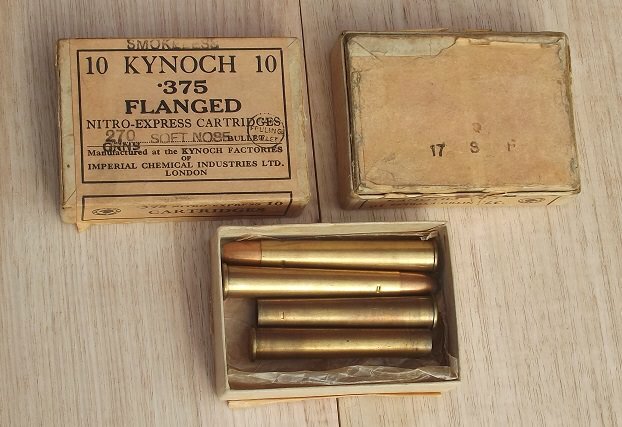 The rounds pictured above measure 3.1" The 375x2 1/2" Fl NE will fit a Lee Enfield mag, many Lee Speeds were built in this calibre. I have personally built one on an LSA ( London small arms ) action, the mag has to be modified to feed the fatter, straight wall case, but they fit and work. P.S.....you can cut a 375/303 chamber with a 303B reamer with a modified pilot. interesting - never seen such a thing , dated ? outdated ? A fairly old round, popular with Elmer Keith, BSA built a few Enfields in it, gaining in popularity now after the Lee Speed resurgence created by the " Ghost and the Darkness " movie. The packet pictured was manufactured in the '30s. 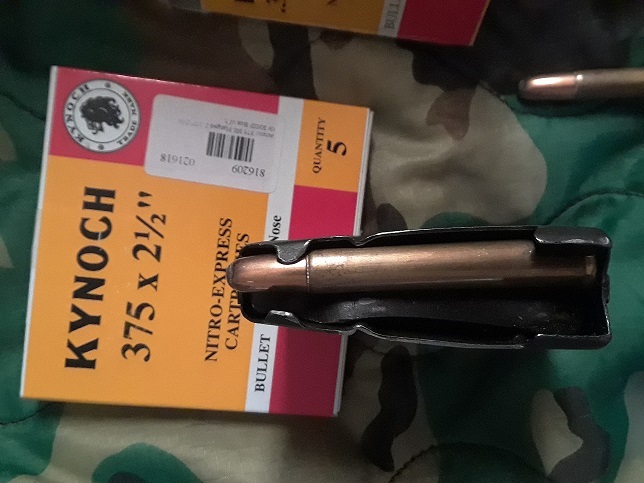 Good choice for a " light " heavy rifle, if you know what I mean, works well in the old Smellie......cases with the correct headstamp can be expensive, but they can be made from 405W or 9.3x74R brass. Very useful stuff to know, Roger. Thanks for that! Got a candidate barrel here. Lovely Long Lee barrel, and bore is pitted badly full length. 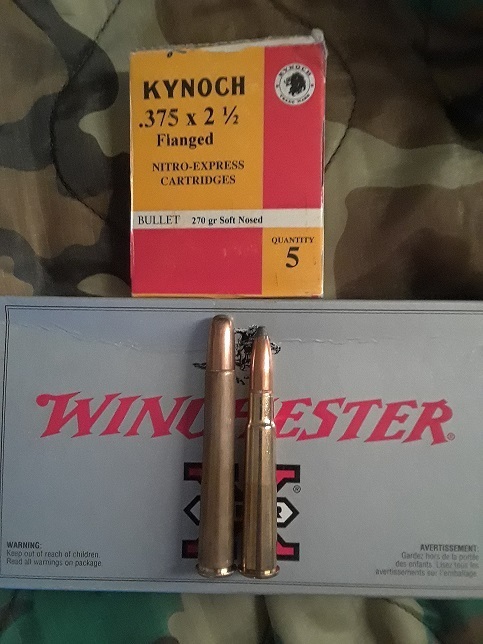 First just a bit about the differences between the .375 2 1/2 Flanged NE, .375 Flanged Magnum (or H&H Flanged) and the .375 H&H Belted Magnum. 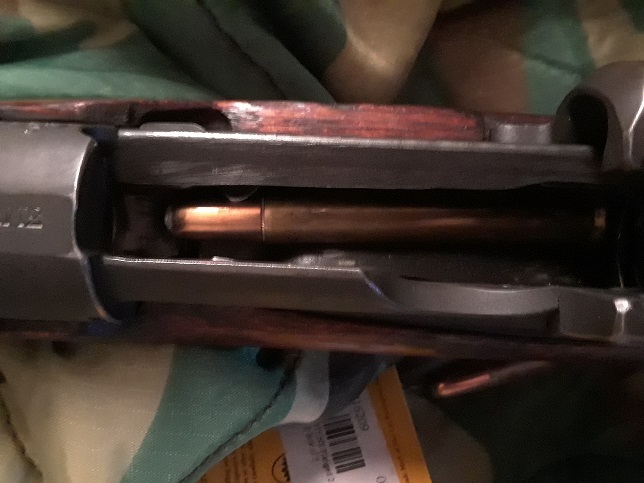 With that much of the bullet (a Woodleigh 270 grain RN SN) hanging over the mag and on the feedramp with only one round in the mag I just do not see how this can work. Again I know it has been done. And I truly believe you yumastepside. How did you do it? And how do you modify a 303 British reamer to use a .375 pilot? Teach me! Now my sweet old sportized ERA Pattern 14 in .375 2 1/2 Flanged is the cats meow! Sorry for my vague comment.....a pilot is put over the end of the 303 reamer to fit the 375 barrel and then a 375 throater is used to finish the chamber. My intent was to say that you don't need a 375/303 dedicated reamer. As for the mag, yours may be a different mag to mine, I think mine are NoIMkIII. 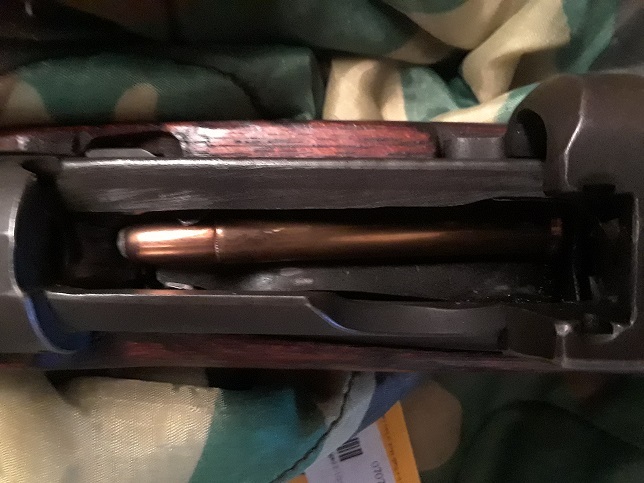 That is a mag from my 1941 Lithgow.